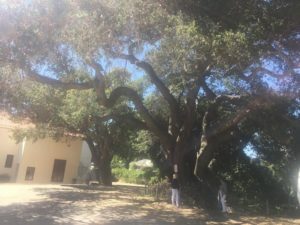 The San Luis Coastal Unified School District has angered neighbors of San Luis Obispo High by announcing plans to cut down large trees on campus and replace them with new buildings. Protesters expressed their outrage on Wednesday by holding a tree sit-in. District plans call for the removal of a large eucalyptus tree, which San Luis Coastal says is unsafe. The tree will be replaced with a new student support center and performing arts building. Likewise, a large Heritage Oak and other trees located at the northern edge of campus will be removed and replaced with a 12-classroom building. District officials say there are few, if any, places to build on campus, and they need to meet the expanding needs of students. Workers will remove the trees next week and begin construction on the annex classroom building next month, according to the school district. The district says it will replant trees for every tree removed over the next five years. John Salisbury, who lives next to the large oak tree, said the district lulled neighbors into a “bait and switch.” Salisbury stated in an email that, in April, the district distributed flyers showing the trees would remain. But more recently, neighbors were told the trees would be removed. “When finally getting an acute layout just two weeks ago, we were shocked to see all the trees are to be removed and the building practically in our backyards,” Salisbury wrote. Assistant Superintendent Ryan Pinkerton said in a response to Salisbury that the district has been very clear about its intentions and needs. It isn’t a “Christian Based” organisation. It’s a Christian Owned Private Company. Big difference. I have no problem working for Christians (or Muslims, or Buddhists, or Sikkhs, or anyone else, but it’s cool to hate Christians now, right?). I won’t work for a Christian based organisation. Clearly, the goal is to make these place of education as much like an institution as possible. Think Coalinga State Prison. It’s appropriate if you think about our current state of affairs and who’s in charge. Pack ’em in. Ship ’em out. Bond measures, environmental impact studies, plans posted for all to view for the last 2 years, and last But not least -It’s not your property!